The Whitsunday Islands in northern Queensland are world renowned for their sailing opportunities as well as the natural beauty of the area. In 2015 when Kelly and I sailed our yacht Catlypso from Sydney to just past Townsville, we spent over a month in the area. The one thing that I did not expect when here was to find some excellent dive sites. On my only other trip to the Whitsundays (in about 1985 I think), I was a bit disappointed with the water quality. However, once you get away from the mainland, the water is very clean. The northern-most islands are Hayman and Hook Islands. We spent a lot of time around them, especially on the northern side of Hook Island. This seems to have the cleanest water. One of the advantages of diving in this area is that there are plenty of boats around. 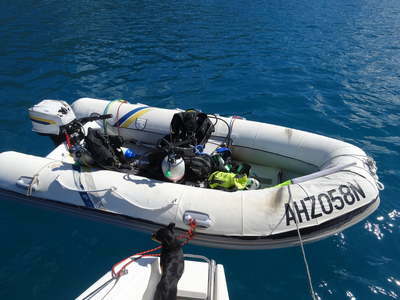 This means that for us, with only two people on board, we can safely leave Catlypso on a mooring and also our know that our RIB (which we dive from) will not drift away unnoticed. A satellite photograph of the northern side of Hook Island. Manta Ray Bay is the bay to the far right. 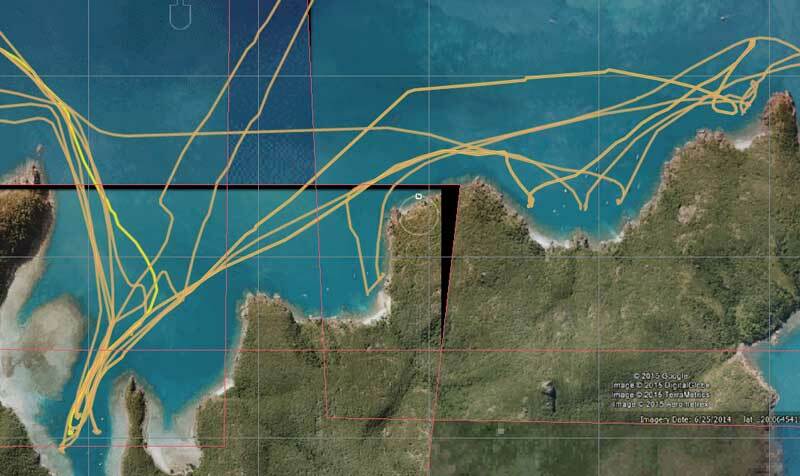 We mostly moored Catlypso where at the bottom left or the bay to the west of Manta Ray Bay. Manta Ray Bay is the best dive site at Hook Island, or at least the best of the ones we did. Manta Ray Bay is located on the north-eastern point of the island, just to the west of The Pinnacles. This is a small bay which is visited by virtually every tourist boat. It is a very busy location. All the day boats come here for a snorkel and all the overnight boats arrive at least once per three night trip. Unfortunately there are only three moorings in the bay and it is a bit deep for yachts to anchor as it drops to over 18 metres not far off the island. When we dived here, we mostly left Catlypso on a mooring at Butterfly Bay or the nearby Luncheon Bay. We then took our RIB, Thunderbird 2 , to Manta Ray Bay and used one of the small boat moorings. We tried to dive early so we missed most of the tourists. Once on a mooring, we drop into the water and descend. We follow a gully from the mooring to the north till we reached the end of the coral reef. The bay has a fringing coral reef that is an excellent snorkel. From here we generally went to the north-east following the slope at about 20 metres. The bottom slopes down gradually, probably to over 30 metres. There are some smaller bommies/outcrops along the way. 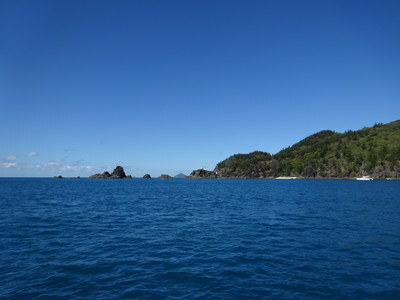 On our five dives at this site, we saw lots of seapike and trevally along the way. We went past the large moorings, there are lots of fish under the boats here. We also see white-tip reef sharks, a huge number of blue fusiliers, especially under the northern mooring. We kept going in this direction for 25 minutes. We see some large anemones with anemonefish, dozens of nudibranchs, and lots of butterflyfish, some surgeonfish, parrotfish and a huge crayfish. On the way back we are a bit shallower, at 15 metres. Once we get back to the gulley that leads back to the mooring, we go past it to the south. There are some very large coral bommies here and smaller ones out further. How far we went north-east determined how far we went south once we got back near the mooring. You could also do a dive totally to the south (and south-west) like we did one time. We did not go that far and you could certainly go a lot further than we did. On all our dives we spent our safety stop near Thunderbird 2 as this is about five metres deep. On every dive there was at least one huge Maori wrasse under the boat. This is an excellent dive site. We had visibility ranging from 20 to 30 metres.